We decided to do a little bag for Lucas, with big brother gifts, from his little sister. We didn't go over the top and wanted to keep the price to a minimum, but we did want something that can be given to him when his sister is born and he comes to visit her for the first time. We thought practical and also what would be great for him to play with at the hospital too. After browsing the web for ages we finally cracked it. 1. 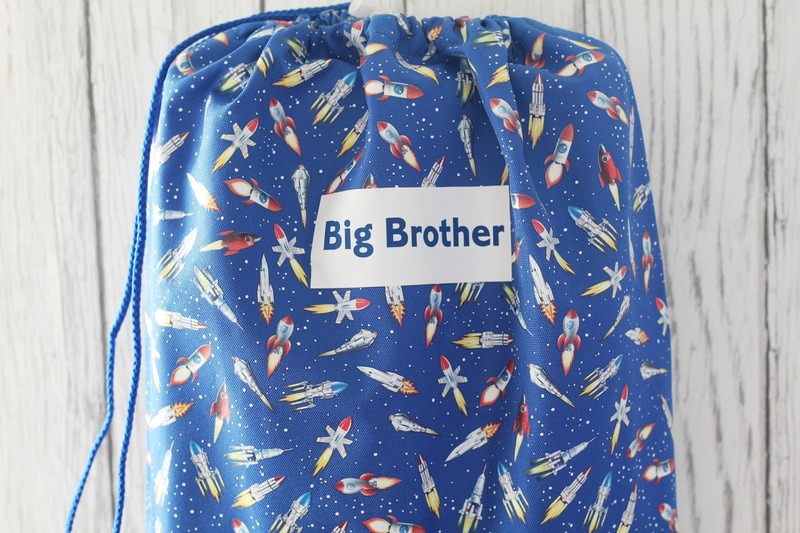 PERSONALISED SWIMBAG - This has been purchased with the personalisation saying "big brother," and it's from studio. 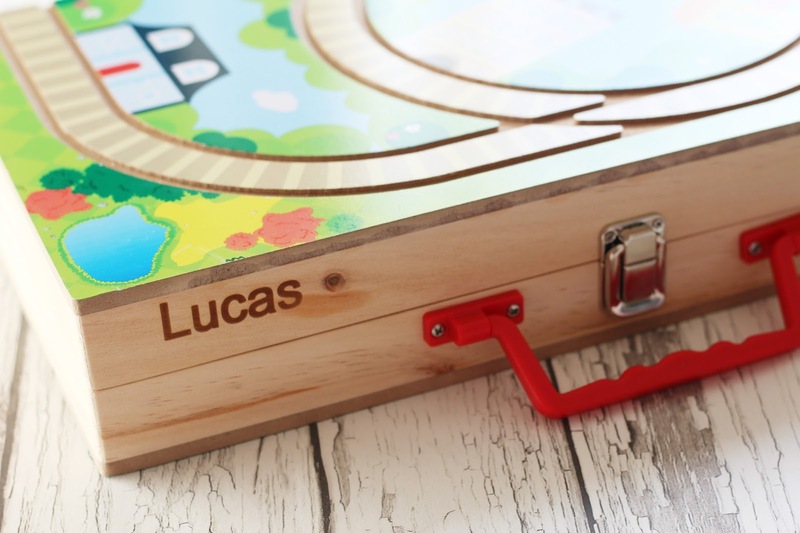 This is what we're using as a gift bag, and it is something that when i'm recovered and Iris is a little older, we can put Lucas' swimming bits in and go swimming as a family with. It is multi purpose and they do, do a few different designs. It's really cheap and was much bigger than I expected on arrival and i'm really glad as it meant we could use it as a gift bag too. 2. 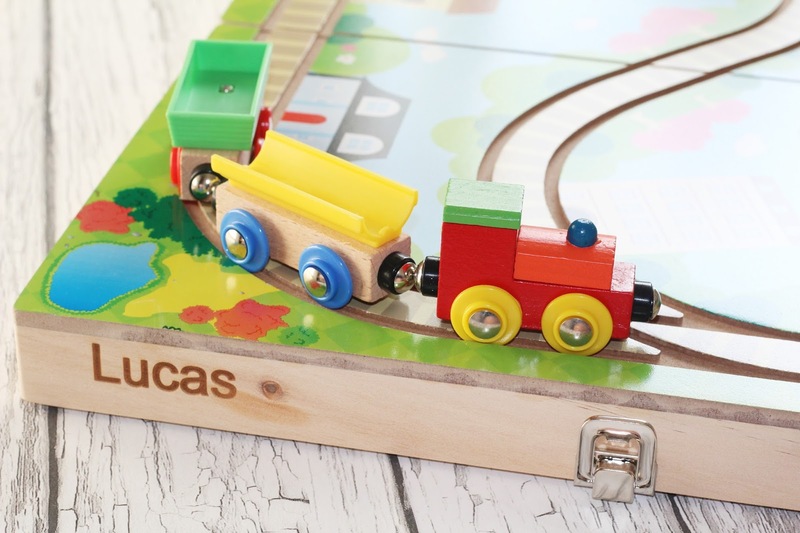 PERSONALISED TRAIN SET - Another item from studio, this is a little train set in a fold up box, that is perfect for 1:1 time after she's born and she's napping and also perfect for setting up on the hospital table for Lucas to play with whilst visiting us after she's born. I'm hoping this will mean he wont demand "trains" on our phones. This is one that is timeless, and is just lovely. 3. SNUGGLE THE BABY BOOK - This is one where it's interactive, you help swaddle the baby, feed the baby, put the baby to bed, tickle the baby, ect... Lucas loves interactive and lift the flap books and this is great and will hopefully help explain to Lucas about helping with the baby and when i'm feeding the baby, he can feed his baby in the book, ect... It's another nice one and a change from more "big brother books." I have a feeling he's really going to love this book. 6. GALT WATER MAGIC FARM - A cute little reusable book, another one thats great for one to one calm down time during Iris' sleepy times. I didn't want him to be bored or over hyped during the times Iris is sleeping and think it's the ideal time for one to one time. so this book is wonderful and he loves animals. It's also mess free so you cannot go wrong either! 5. CONGRATULATIONS YOU'RE A BIG BROTHER CARD - This one is personalised with his name and it's been written and sealed, from mummy, daddy and his new sister. It will be something that is put in a memory box and kept for him to read when he's older and understands as at the moment he's just too little to care. This card is beautiful. 6. 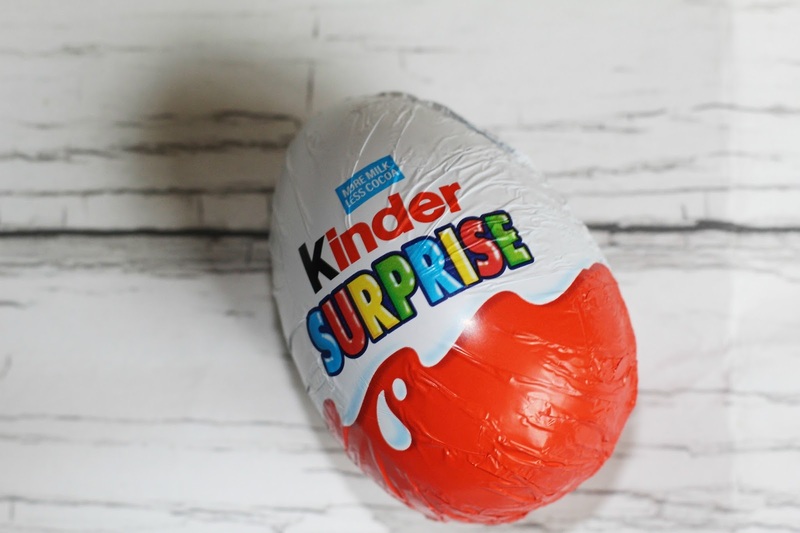 A KINDER EGG - A simple little chocolate gift. Lucas loves kinder eggs, he loves the chocolate and the fact that he gets a toy too. So this is a really simple gift for him and something he'll be able to eat too. We've kept it really simple and not gone overboard and spent a fortune, but wanted to treat Lucas to some gifts from his new baby sister. 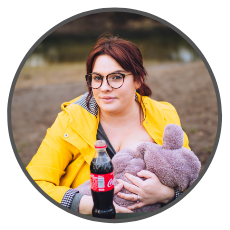 What did you buy for your eldest? Did you buy at all?